In the ever-increasing search for effective, efficient, and economical solutions for the solar industry, ultrasonic welding is emerging as one of the more usable technologies available for manufacturing solar panels. Ultrasonic welding is a clean way of manufacturing solar panels. It doesn’t rely on fossil fuels or other polluting materials to produce the energy it needs to do its job, which is a plus in and of itself. However, ultrasonic welding also succeeds at manufacturing solar panels like any other connection method. 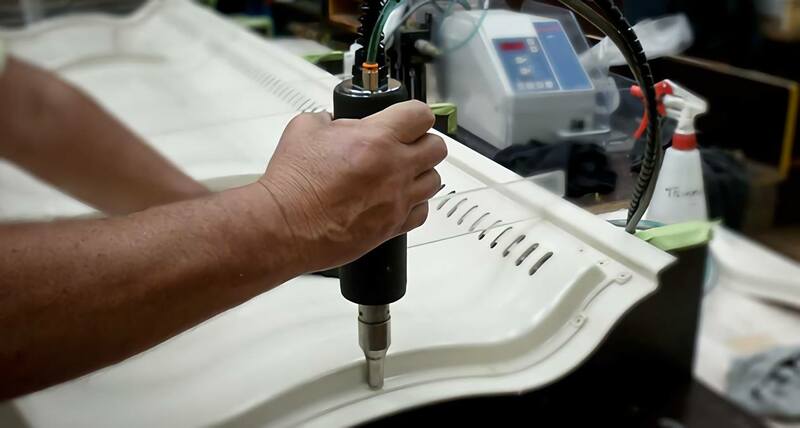 For these reasons, ultrasonic welding is quickly becoming the connection method of choice in the solar panel industry. Ultrasonic welding is increasingly being used to weld aluminum foil to metal-enhanced glass on the photovoltaic cells on solar panels. This type of welding results in an ideal bond. It is a solid metallurgical connection with few rivals. The close bond produced by ultrasonic welding gives the photovoltaic cells increased conductivity, which improves their effectiveness and efficiency. Ultrasonic welding is a quick method of producing solar panels. It is also very cost-effective, so many companies are jumping on the bandwagon to use it. It is also extremely safe. It will not crack the glass on photovoltaic cells and it does not warp or distort other materials, as some other welding methods may do. This ease of use with solar panel materials reduces the cost of replacing broken or damaged materials that can result from other, less sophisticated welding methods. Ultrasonic welding is easy to learn how to use, so costs for welding training and money lost from time away from work for training is reduced for solar panel manufacturing companies that adopt it. The many benefits of this type of welding result in significant cost, time, and resource savings for companies. The one-time investment in the ultrasonic welding equipment is more than made up for with the savings in other areas solar panel companies will achieve with this new technology. The keyed shaft at the head can be adjusted to make sure the welding disk spins at the same speed as the photovoltaic panel. This helps the welding process operate more smoothly right off the bat. There is a solid state frequency converter in the power supply of an ultrasonic welder. This means the frequency does not have to be manually adjusted when the ultrasonic welder is introduced. It has an automatic tuning control, so tuning does not have to be done manually, either. Ultrasonic welders are generally available in 110 or 220-volt varieties, so they fit into any factory’s environment. Power consumption is lower than other welding methods, so manufacturers save money on energy costs from the time they first use an ultrasonic welder. Ultrasonic welding is cutting edge because producing the weld just takes a few seconds, and does not use any other material to do its job. Other welding devices may use solders, tapes, and other extraneous materials to create the welds. The ultrasonic welder uses only the ultrasonic welding unit and nothing else to produce its incredible welds. All the unit uses is vibrational energy applied under pressure1. This actually creates a more pleasant working environment for welders, since it produces far less heat than traditional welding methods.